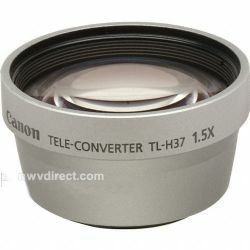 The TL-H37 extends your Telephoto viewing by a factor of 1.5x. Not enough zoom? Make those distant scenes closer to you by extending your Telephoto capabilities with Canon Optics by using the TL-H37 Tele Converter. The lens screws onto the front of the camera's zoom lens. Never miss a shot again.